Then there is the NGO driven non-violent social justice movement (much better than the Maoist driven violent one) which ensured passage of the Right to Education (RTE) act that dictates that 25% of the elite school seats must go to the slum-kids in the vicinity. Ashok points out (and we agree) that credit must also be given to the UPA-II regime for this achievement, however it must be emphasized that without the enthusiasm of the NGOs such a law would never get implemented in reality. As per the law, not only will the tuition for Economically Weak (EWS) students be free - presumably all this will be cross-subsidized by upper middle class parents - the students have a right to free books and uniforms as well. Naturally, the resistance is huge, the elite class will not easily abolish themselves. But make no mistake, this is the face of soft revolution. There is a lot to be said both for and against reservations. But there is no doubt that the Indian policy of running the largest affirmative action program in the world is designed to do two things: it gives people at the bottom of the ladder hope (one day, their children can be Prime Minister just like the chai-wallah's son). Secondly, it reduces the resentment just a little bit and thereby increases the stake of the poor in the democratic order. "My daughter speaks such good English, like they do on TV" is a phrase that will melt the heart of the harshest cynic. We hope. In 2006, the school wouldn’t let them stand at their gate, watchmen would shoo them away. When, after several protest dem­onstrations, they were finally let in, they were curtly told seats for weaker sections had already been filled. Not a single child from their slum, the only one in the vicinity, had however been admitted. The next academic year, hundreds of them gathered outside the school on the first day the forms were distributed. “Ryan International was so fed up that they asked us to write our children’s name on slips, place them for the draw and pick them ourselves. This time all the seats meant for weaker sections went to children from our slum,” recalls Sunita, laughing. Her husband is an auto-rickshaw driver and her son now studies in Class III at the school in the Vasant Kunj locality of southwest Delhi. “When the activists first asked us to fill applications in these schools, we thought they were mocking us and we abused them roundly, asking them to get lost. When they still didn’t leave, we ignored them. But they didn’t give up and today we are so glad they didn’t,” says Malik, a vegetable vendor. “We couldn’t imagine stepping inside the school,” he goes on to say. “But now my daughter goes there every day to study and spe­aks such good English, like they do on TV.” His eight-year-old daughter studies in Class II at the Vasant Valley school, in the same area. Over 200 children from Rangpuri Pahari, the area Malik and others live in, now go to the several private schools in and around here, among them Ryan International, Bloom Public School, Vasant Valley and Delhi Public School. The parents in the slum have come together to form the Sajag Society, an association of EWS parents, to discuss their problems, help each other and encourage more children from the slum to exercise their right to education. 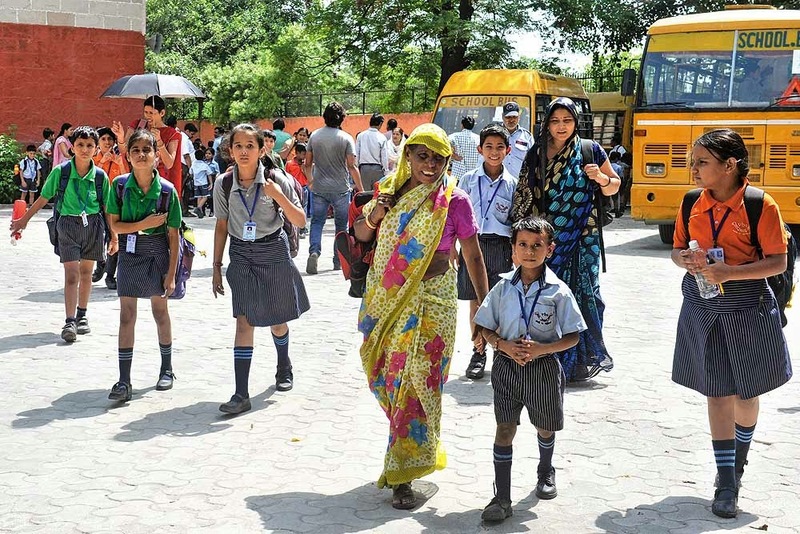 Delhi today records the highest number of EWS admissions in private schools across the country. Yet it isn’t easy for the parents. They still have to pay through their nose. “We don’t have to pay tuition fee, but we still spend about Rs 8,000 a year. Books cost up to Rs 5,000 a year. The uniform does last for over a year because the material is good, but they cost around Rs 1,500 for each set. Shoes again cost around Rs 800,” lists out Renu, who works as a domestic help. Even as the government has ordered schools to provide free (no fees) education, including free books and uniforms, few schools pay heed to the provision. And the centralised system, which ensures admissions based on a lottery, doesn’t allow parents to select a school based on affordability. Vasant Valley, parents say, is the only school in the area which has provided free uniform for the first time this academic year. dps, on the other hand, distributes books of senior students to the poorer students, instead of giving them free books as per the law.